If neither smart TV, 3D nor even Full HD are on your radar, then this 32-inch LCD TV from Panasonic's X5 Series could be just what you're after. Those super-slim, app-packed flagship TVs from the major brands may come with the latest picture and interaction tech, but for the average living room most are massive overkill. Step forward the excellent quality Panasonic TX-L32X5, whose three-pronged assault on the mass market is likely to sell in droves; LED backlighting, a Freeview HD tuner and some rudimentary handling of digital files should make sure of that. Design-wise it doesn't break the mould (though its gloss black screen surround and 53mm depth aren't too shabby), and nor are we expecting cutting-edge images from its basic 50Hz panel, though the latter is of the IPS Alpha variety, whose forbears have impressed us numerous times before. Could this be the everyman TV we've been waiting for? Separate from Panasonic's vast range of LED and plasma-flavoured Smart Viera TVs, the Panasonic TX-L32X5 - priced at around £450 in the UK or $400 in the US - is part of the Japanese brand's X5 Series, which also includes the 19-inch Panasonic TX-L19X5 and 24-inch Panasonic TX-L24X5. However, the X5 Series isn't Panasonic's cheapest – that honour goes to its C5 Series, which is comprised only of the 32-inch Panasonic TX-L32C5. It's fitted with a basic LCD panel – no fancy LED illuminations here – and thus offers lower contrast, with less powerful speakers and a larger 196mm depth, too. That said, Freeview HD still comes as a default feature. Smart Viera begins at the Panasonic E5 Series, which is formed of the 32-inch Panasonic TX-L32E5B, 37-inch Panasonic TX-L37E5B, 42-inch Panasonic TX-L42E5B and 47-inch Panasonic TX-L47E5B. Here you'll find Panasonic's Viera Connect interface of apps such as BBC iPlayer and BBC Sport, as well as a Full HD panel and a fourth HDMI slot, although the panel depth is an identical 40mm. If you long for a 3D TV, or just want to future-proof from within Panasonic's ranges, think about either the ET5 Series or ET50 Series. The former uses passive Easy 3D tech – much like LG's Cinema 3D TVs – while the latter uses Panasonic's own Active Shutter 3D Full HD system. Good, typical examples of both collections include the 42-inch TX-L42ET5B and 42-inch TX-L42ET50B. 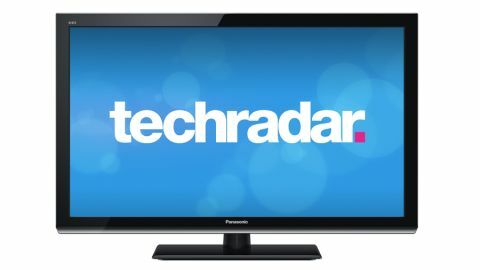 Despite being fitted with a Freeview HD tuner – a must-have – some LED backlighting and an IPS Alpha LCD panel that usually creates a wide viewing angle, the Panasonic TX-L32X5 is nevertheless firmly on the second rung of flatscreen TVs. Its 50Hz panel and relatively primitive 1366 x 768 pixel resolution (which earns it merely HD-ready status) make sure of that, but there's still plenty onboard that makes this a sturdy choice for a living room or bedroom. While most TVs now come with a connections box attached to back that puts all ins and outs either downward-facing or protruding from the side (though recessed, so invisible to the viewer), the Panasonic TX-L32X5 uses the older idea of cables simply sticking out of the back. Since the TV is not a super-slim model, and will therefore probably live on its desktop stand, it shouldn't make much difference. Three HDMI inputs lead the charge, one of which is ARC (Audio Return Channel) compatible, and one mounted on the TV's side. Meanwhile there's an adaptor supplied for choosing either component video or composite video, while also back there is a D-sub 15-pin slot for a PC, an RF-in for fuelling Freeview HD, some analogue phono ins (no outs are included), and a digital optical audio output for routing sound to an AV amplifier. Note the lack of both a headphones jack – which may irritate some – and the need to output audio via digital means only. It's also worth remembering that there's no internet dimension whatsoever, so Wi-Fi adaptors are useless; the USB slot simply won't take them. Although this purports to be a basic living room television, it's good to see some decent support for digital files. While it doesn't have a web connection so can't interact with networked PCs or smartphones, the Panasonic TX-L32X5 does have a USB slot and that Panasonic signature feature, an SD/SDHC card slot. The latter is useful for digital cameras, of course, though the TV's Media Player software can play a plethora of files from both USB and SD Cards; JPEG photos, MP3 and AAC music files, and AVC HD, AVI, MP4 and MKV videos are all played back. Most of those formats are now standard on most TVs, but it's always good to see MKV support (though it doesn't handle subtitles for MKV files). There's no support for lossless FLAC music files, as there is higher up Panasonic's TV ranges, but we're not particularly sad to see that go. If you're wanting to wall-mount the Panasonic TX-L32X5, Panasonic makes the tilting TY-WK3L2RW, though it's got industry-standard VESA wall-mount fixings, so myriad other brackets will work, too.